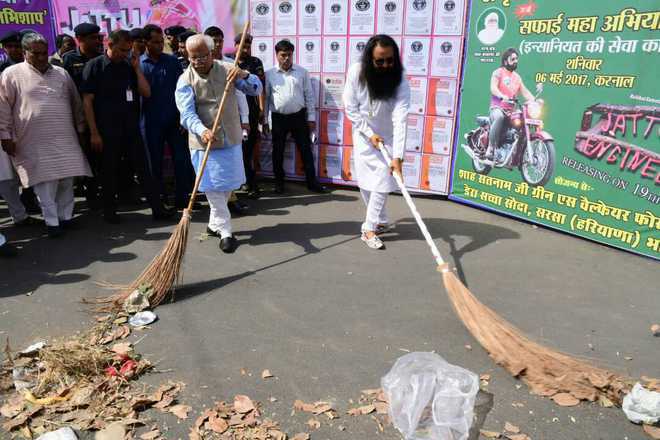 The controversial sectarian guru Gurmeet Ram Rahim Singh, whose fate will be decided by the CBI court in alleged sexual abuse case on Friday, had played an important role in forming the first BJP government in Haryana in 2014. Political researchers said the Sirsa-based dera’s move to support the BJP had helped the party register a thumping victory in the last assembly election. Though the dera is known for extending support to various political parties in Punjab in the last few elections, it was for the first time in that the sect had come open in the Haryana’s electoral politics. In October 2014, the political wing of the dera had announced to support the BJP in the assembly elections and several top BJP functionaries had visited Sirsa for the ‘blessings’ of the dera head. State coordinator of Lokniti, a social science research programme of Delhi’s Centre for the Study of Developing Societies (CSDS), Kushal Pal told The Tribune today that a study of constituencies indicated that the dera supporters followed the diktat to vote for the BJP, irrespective of candidates, almost en block. Pal, who is also head of the political science department at the Karnal-based Dyal Singh College, said it was the first time in Haryana’s politics that religious sects officially played such a significant role in key parties’ agenda. Though the dera had silently supported candidates in the past, it happened officially for the first time in Haryana in 2014, he said. Another analyst said while BJP wooed the dera, the Congress tried to polarise Sikh voters from the Indian National Lok Dal’s (INLD) electoral kitty on the formation of ad hoc Haryana Sikh Gurdwara Management Committee (HSGMC). However, the result of the last assembly polls showed that the Congress’ Sikh panel card did not amount to much for the party. The INLD, too, failed to gain by opposing the move. “Dalits form a sizeable support base of the dera who seem to be insecure because of various incidents around last state elections. The socio-economically backward strata followed the dera head’s directions and the BJP gained in several seats,” Pal said. In few some constituencies, the number of dera followers may not have played a decisive role. But they gave BJP candidates an edge in places where the contest was neck-and-neck, he said. Pal also dismissed that dera’s direction failed to reap benefits in Sirsa district, where the sect is based, and in the adjoining Fatehabad district. “INLD has a traditional base in these two districts and heavy polling indicated that Jats, the party’s traditional vote-bank, were consolidated to save its electoral grace,” said Pal.